On this day in 1780, one of history’s deadliest storms, with raging winds up to 320 kiometres per hour (200 mph), struck the Lesser Antilles, leaving more than 20,000 people dead in its wake. It was called the Great Hurricane of 1780. Part of the disastrous 1780 Atlantic hurricane season, the deadly storm is also known as Hurricane San Calixto, the Great Hurricane of the Antilles, and the 1780 Disaster. It death toll exceeds that of any other entire decade of Atlantic hurricanes. Anecdotal evidence of the Great Hurricane’s unprecedented destruction has led scientists to believe it was a Category 5 storm. Though the exact origin of the hurricane is unknown since its occurrence predates the Atlantic hurricane database, historians believe it developed in early October near the Cape Verde Islands, much the same way other hurricanes develop. As it moved westward, it swelled in size and power. On 11 October, the storm turned northwestwards and struck the island of Martinique, weakening as it moved on to Guadeloupe, Puerto Rico, Mona, and present-day Dominican Republic. Its exact path is unknown, but the Great Hurricane is also thought to have struck the northeastern portion of present-day Florida. Historical records of the storm paint a picture of widespread destruction: The strong winds sent heavy cannons hurtling hundreds of feet; it destroyed 584 of the 600 houses in Kingston, Saint Vincent; and it wrecked 19 Dutch ships in Grenada. The storm brewed in the midst of the American Revolution, adding a third force to the bloody war. It caused a fleet of 40 French ships to capsize off of Martinique, drowning some 4,000 soldiers. Rough waves destroyed the fleet of British Admiral Rodney at Port Castries on Saint Lucia. Until Hurricane Mitch struck Central America in 1998, no Atlantic hurricane has come close to matching the destruction wrought by the Great Hurricane of 1780. To this day, it remains the deadliest Atlantic hurricane on record. 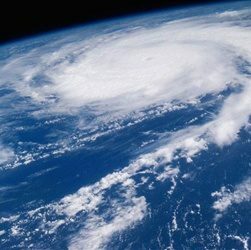 Caption: A view of a hurricane from space.